Zion Market Research has published a new report titled “Sports Nutrition Market (Sports Food, Sports Drink & Sports Supplements): Global Industry Perspective, Comprehensive Analysis and Forecast, 2016 - 2022”. 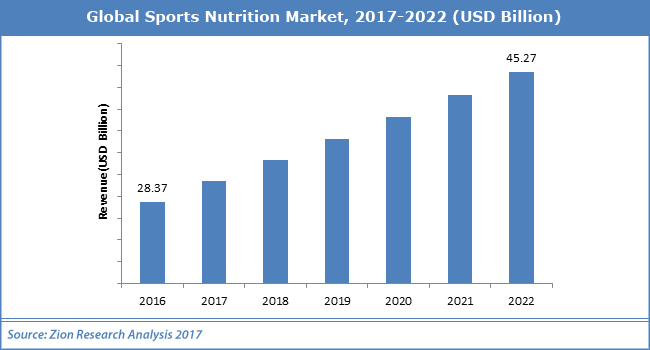 According to the report, the global sports nutrition market accounted for USD 28.37 billion in 2016 and is expected to reach USD 45.27 billion by 2022, growing at a CAGR of around 8.1% between 2017 and 2022. Sports nutrition refers to the consumption of nutrients such as vitamins, minerals, supplements and organic substances that comprise of carbohydrates, proteins & fats. Sports nutrition products, such as sports drinks, sports food & sports supplements are developed for, and consumed by athletes and bodybuilders to improve their overall health, performance, and muscle growth. Sports drinks are primarily consumed by athletes to replenish the water level in the body.These products are increasingly attracted by lifestyle and recreational users. Currently, the developing countries represent a huge growth potential for these products on account of rapid urbanization, increasing disposable income, and a higher percentage of the young population. The sports nutrition market is expected to witness significant growth within the forecast period on account of increasing demand from recently emerging lifestyle and recreational users’ group. In addition, increasing health awareness coupled with increasing number of health clubs and fitness centers is also expected to boost this market within the forecast period.Apart from this, rapid urbanization, increasing disposable income augmented with increasingly purchasing sports nutrition products as healthy snacks as a part of diet are also expected to boost the growth in sports nutrition market.The high number of cheap counterfeit products affects sales of reputed companies and therefore, availability of these products is expected to restrict the growth of sports nutrition market. Expansion of distribution channel is also expected to be an opportunity for growth in this market in coming six years. Types of sports nutrition products include sports food, sports drink & sports supplements.Sports drinks segment accounted for the largest market share of the overall market in 2016 and is expected to be the leading contributor in coming six years.Rapid urbanization coupled with increasing disposable income is expected to fuel the demand for sports drinks globally. Sports drinks were majorly used by athletes to replenish the water level in the body but are undergoing mass adoption by lifestyle and recreational users. The market growth for sports drink segment was more than 6.9% in 2016. However, sports food segment is expected to witness the fastest growth in coming six years.The demand for sports supplements is expected to boost by increasing consumption among women and other households users owing to increasing consciousness towards personal appearance. In terms of geography, to represents North America is expected to account for the largest market for sports nutrition products and dominated by the U.S. It has accounted for more than 38% market share for sports nutrition products in 2016. The growth in this region is majorly supported by benefits from high incomes, world-class fitness and athletics infrastructure. Europe sports nutrition market to represent a major market for sports nutrition products, led by the U.K. fuel by the increased number of consumers opting for healthy lifestyles. Asia-Pacific is the fastest growing market for sports nutrition products within the forecast period fueled by an increase in disposable incomes coupled with rapidly changing lifestyles. Japan is expected to dominate this region in sports nutrition market. China is expected to gain the second largest market share followed by the Australia due to a higher percentage of the obese population. India is expected to witness the notable growth in coming six years fueled by the increasing adoption of sports nutrition products amongst lifestyle & recreational users. Latin America and Rest of the regions are expected to witness a healthy growth in this market within the forecast period. Some of the key players include in plant growth market such asNestlé S.A., Glanbiaplc, Maxi Nutrition Ltd., Abbott Nutrition Inc., Yakult Honsha Co Ltd., The Coca-Cola Company, Reckitt Benckiser Group Plc, GNC Holdings Inc, Pepsi Co., and Honsha Co.